GARRET MEADE PHOTO | David O’Day of Southold, driving past Shelter Island’s Hunter Starzee, scored 24 points. Suffolk County League VIII has some good, young basketball players who are making a name for themselves this season. Possibly the one with the longest name of them all, Matt BeltCappellino, may have shined the brightest of them all on Friday night. Junior BeltCappellino scored 19 first-half points before finishing with a career-high 29 for Shelter Island in its 70-63 defeat of host Southold. He bettered his previous game-high total by 8 points. Meanwhile, Southold had a sophomore putting up big numbers. Liam Walker registered 24 points, 4 rebounds, 4 steals and 3 assists for his side. 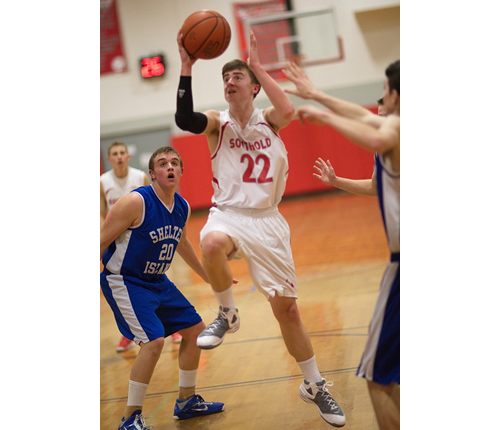 A Southold senior, David O’Day, also produced 24 points. Aside from the fact that BeltCappellino is a forward and Walker is a guard, the two players share some notable similarities. They both wear the same uniform number, 12, and they both have undoubted scoring ability. Like BeltCappellino, Walker recently turned in a career-high scoring total. In Southold’s previous game, a win over Smithtown Christian three days earlier, he scored 36 points. As is BeltCappellino, whose efforts have helped put Shelter Island (5-6, 5-3) on a pace to reach the playoffs. In addition to being one of the top students in his class, he also has the basketball smarts and shooting ability that the Indians need. Friday night was one of those times. Three days earlier, Shelter Island led Greenport for three quarters and most of the fourth before succumbing and losing. That loss, Mundy said, turned Friday night’s game into a “must win.” Every league game is precious as far as playoff implications are concerned. Shelter Island led by as many as 19 points three times in the third quarter. Southold, however, worked its way back, pulling to within 6 points of Shelter Island during a 17-6 run in which O’Day scored 9 points. When O’Day nailed a 3-point shot from the top of the key, it made the score 66-60 with a little over 30 seconds left in the fourth quarter. Shelter Island secured the victory with two free throws each by Myles Clark and BeltCappellino down the stretch. A big factor in the game was the rebounding department, where Shelter Island held a 40-25 advantage. Hunter Starzee (16 points, 16 rebounds) was a major contributor. Riley Willumsen had 8 assists for Shelter Island, which made good on 60 percent (24 of 40) of its field-goal attempts. Southold (3-9, 2-6), which lost for the sixth time in seven games, received 11 assists from Kenji Fujita. But Southold’s better days are to come. The team is two losses away from being eliminated from playoff contention, but the future looks bright with sophomores like Shane Johnson, Alex Poliwoda and, of course, Walker. Two wins from its final six league games would earn Shelter Island a coveted ticket to the postseason.